pocket watches Swiss or English. In my 25 or so years of collecting and repairing, I have never seen a Hamilton Electric (though I’m no stranger to Accutrons), so when Paul Delury asked me to take a look at one of his Hamilton 505’s (the poor deluded fool!) which wasn’t running very well, I jumped at the opportunity. Armed with Rene Rondeau’s book “The Watch of the Future”, it didn’t take very long to figure out how it worked, and the watch was serviced and now is keeping remarkably good time, within a few seconds a day. 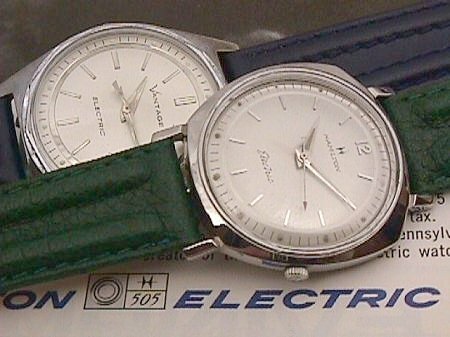 With the benefit of 20/20 hindsight, it is hard to imagine how these watches ever got into mass production…they certainly appear to be a triumph of wishful thinking over sound engineering, or, at least, a triumph of Hamilton’s Marketing Department over its Engineering Department. The Hamilton Electrics were ahead of their time, but missed the boat on taking advantage of the latest technology – the transistor. In their favor, I found the 505 movement very easy to work on, though I understand this is not the case with the earlier Model 500.
license to the Standard Time Corp (Hamilton’s economy watch subsidiary) by Ricoh in Japan. Both movements have 11 jewels, and are fitted with KIF shock protection on the balance. We though it would be interesting to compare the two movements and see what changes were made when production was moved offshore. 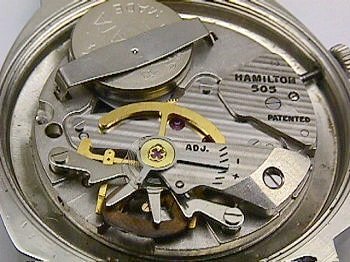 The Hamilton 505 uses a spring clip which hooks into two slots in the bottom plate, and also relies on the movement ring to help locate it. The Standard Time 505 has a slightly deeper battery recess, and a redesigned spring clip. The Hamilton 505 has some traditional Hamilton damaskeening, whilst the Standard Time 505 has only a simple grain finish of the bridges. The cover plate on the keyless work has been deleted on the Standard Time 505. The magnetic shunt under the balance hairspring has been redesigned. The Standard Time 505 is marked “Unadjusted”, presumably because, as it had to be imported into the USA, this would have an impact on customs duties. 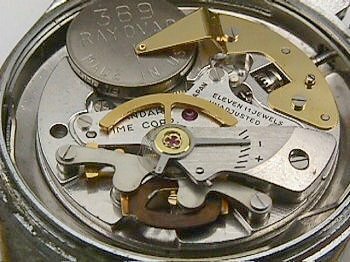 The Standard Time 505 has no provision for case clamps, and the dial feet screws have been moved from the edge of the watch to use cam screws accessible from the back. November 20 2000, Perth, Western Australia.